Professionals work hard and in close coordination for the manufacturing of this Chandrika Soap. It does not show any side effect to users. Chandrika sandal enhances beauty and health, to give you total body care. Extracts from sandalwood and pure coconut oil cleanse and refresh the body, while moisturizing your skin. Keeping it soft, supple and gently perfumed with the goodness of nature. Our reputed entity is engaged in supplying Chandrika Soap. - Dry Clean recommended for this product. Iron inside out. Do not bleach and expose this product to excessive heat and sunlight for long. 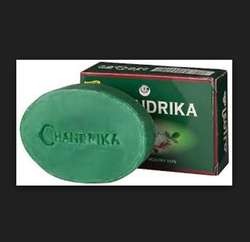 We are a top notch supplier of Chandrika Soap. In order to meet excellent quality standards, we are supplying Chandrika Soap. ‘Chandrika Soap’ is made with pure vegetable oils such as purified Coconut oil, Sandalwood oil, and Patchouli oil; it does not use any animal fat or products. ‘Chandrika Soap’ is not tested on animals. We are engaged in offering Chandrika Soaps. Banking on our enriched industry experience, we are able to supply Chandrika Soap. 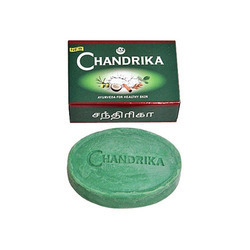 We are engaged in offering Chandrika Soap.